Q: How important have soft drinks become to pubs, bars and restaurants in recent years? A: Soft drinks are so important to the on-trade. It’s the second largest category with only beer and lager bigger. They’re only going to get more important too – soft drinks in the UK have grown over the last 12 months to now be worth over £14.8 billion, with sales from pubs, bars and restaurants accounting for £6.9bn. Part of this growth comes from increased consumer awareness about what we’re putting in our bodies. Also, we’ve seen the younger generation showing less interest in alcohol – one in four Scottish 18 to 24 year olds is now teetotal. Q: What trends are operators likely to see within the market for soft drinks over the coming years? A: Staying on top of trends is really important. Consumers increasingly want an experience when they’re out of home. That means you need to offer new and exciting drinks. Our research shows that as many as 61% of people like to try new drinks. Regularly refreshing your range of drinks is important, but also finding an offer that provides something more unique, with more adventurous flavours and unusual techniques. We’re seeing demand for frozen drinks rocket at the moment for that reason. At Vimto Out of Home we’re the number one frozen drinks supplier to the on-trade and sold more than 40 million cups in the last year alone. Q: How can licensees take advantage of the thirst for healthier drinks in the on-trade? A: It’s all about choice – making sure they have healthy options, that also taste great. A lot of manufacturers have done a lot of work in the past couple of years to ensure their drinks are healthier. Take our range – it’s 100% sugar levy exempt. It’s clear there’s a trend there – we’re seeing our No Added Sugar sales growing at a massive +25%. Q: What effect has the sugar tax had on the sales of soft drinks in the on-trade? The impact has actually been less than expected. It has helped to raise awareness of low-sugar offers and ensure more licensees are stocking a great range of them. It’s also been positive for those that successfully reformulated their products to below sugar levy levels. At Vimto we haven’t seen any negative impact on our sales. In fact, our Vimto brand value has just reached a record £85 million and is growing at a massive +12.5% year on year. Q: What can operators do to deliver on the need for more premium experiences in the on-trade in relation to soft drinks? A: It’s essential that consumers who choose not to drink alcohol feel they are as valued in venues as those who do. Licensees should ensure they are offering the perfect serve, even with soft drinks. It’s even more vital with a premium offer where soft drinks should have something special about them, such as quality glassware that’s been chilled, ice and a fresh garnish. Q: How important is it to have a range which appeals to different types of consumers and different occasions? A: When stocking a range it’s important to consider the different consumer needs, but often there are drinks that cover multiple occasions, eg. those that make nice tasting stand-alone drinks, but that can also be used as mixers. Q: How big has the trend toward frozen/slush style drinks become in the country’s bars and how seasonal is the demand? A: There’s no sensation like slush – and while it’s a drink that was previously associated with theme parks and leisure venues, it’s now increasingly in demand in pubs too. Naturally there’s a spike in numbers during the summer season, but there’s high demand for frozen options all year round. Our Killer Combo promotion we’ve introduced for Halloween is already selling well. We’re also expecting a spike in the lead up to Christmas. Q: What support does Vimto Out of Home offer licensees in Scotland? A: We’re the third biggest post-mix provider in the UK and offer the widest choice of brands and flavours. Vimto Out of Home is also in a unique position – we’re the only company in the UK licensed to Coca-Cola products on draught. Our post-mix range includes V-Range products as well as global brands such as Irn-Bru and, of course, Vimto. We also offer innovative POS and digital screens where Vimto is sold to help licensees display the breadth of drinks on offer. When it comes to our frozen offering, we provide quality free on loan equipment together with the best in class service. 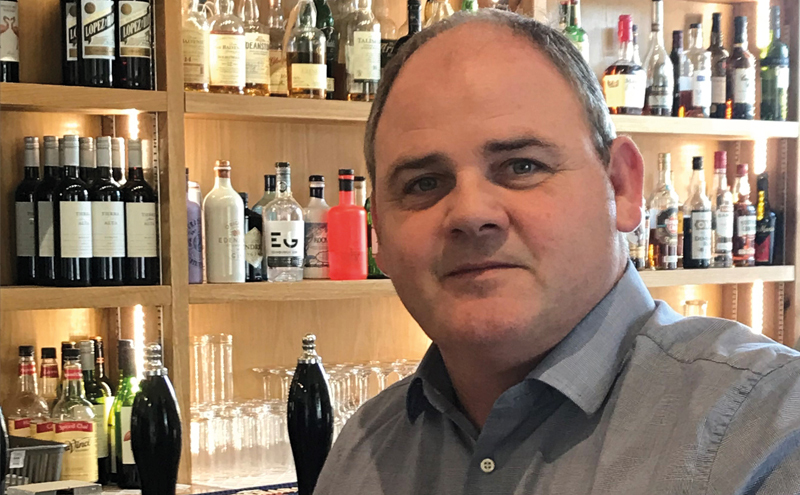 Q: With continual strong demand for spirit mixer serves in the on-trade, have any kinds of mixers become surprise ‘must stocks’ for pubs over the last 12 months? A: Other than slush? Sparkling, sophisticated soft drinks made with botanical extracts are increasingly in demand as a mixer. They can also be used for mocktails instead of standard choices to add extra flavours.